Vehicle Emergency/Safety Kits Direct Traffic Away From Danger And Prevent Accidents. Vehicle Emergency/Safety Kits can be stowed under the seat or in the trunk of vehicles for easy access in unexpected events or breakdowns. Kits contain a variety of emergency supplies to suit user needs. Emergency Warning Triangle Kits contain three reflective triangles with weighted base and wire bracing, as well as a durable plastic carrying case. 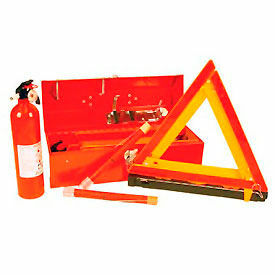 Emergency Safety Kit contains three reflective triangles, portable fire extinguisher, flares with wire stand hold down strap, and a heavy duty steel carrying case. Extinguisher meets all DOT specifications. Available kit types include Drivers Safety, Emergency Highway Road Flare, Fleet Safety, Fusee, LED Safety Baton, Road Flare, Triangle, and Vehicle Emergency Safety Kit. Dimensions vary per model. Emergency LED Road Flares and Beacons Identify Road Hazards, Mark Detours, Underwater Repair Applications And More. Emergency LED Road Flares are made of crush proof and corrosion proof durable materials. Flares do not produce flame, smoke, or harmful bi-products. Rechargeable so no batteries are required. 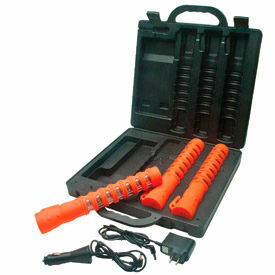 Kits includes LED Road Flares in a charging/storage case. Flares will be charged and ready for use when needed. Each flare includes up to 24 super bright blue LEDs visible up to ½ mile, 9 flashing patterns including SOS Rescue. FlareAlert Beacons These are perfect to use in work zones, risk management, warehouse safety, public safety and the hospitality industry. LED Beacons are a perfect replacement for dangerous strike flares. Colors are Blue, Orange, Red, Green, White or Yellow. 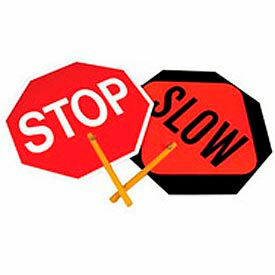 Paddle Signs Provide Traffic and Pedestrian Warnings For Construction Sites, Parking Lots, Commercial Properties, and more. These paddle signs are designed to direct drivers and pedestrians away from potential hazards. The bright colors and large letters increase the sign visibility over long distances or dark environments. The signs are made of aluminum, plastic, or vinyl making them corrosion resistant for outdoor use. The lightweight design minimizes arm and wrist stress to be easily held for long periods of time. 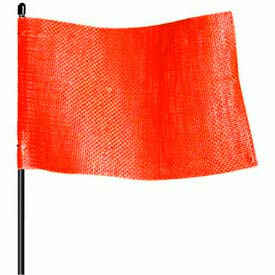 Traffic Safety Flags Direct Drivers And Pedestrians Away From Potential Hazards. 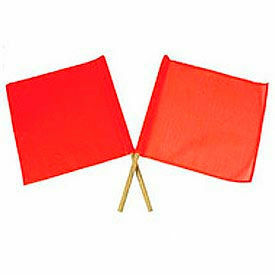 Traffic Safety Flags are made of mesh, plastic or vinyl for long lasting durability. Water repellent. Bright color provides maximum visibility. Flags are mounted on 27 length wooden dowel handles that are easy to grip. Available colors are Orange or Red. Available styles are Mesh, No Diagonal, Plastic Diagonal, and Vinyl Flags w/Wood Staff. Seat Belt Covers Enhance Driver Visibility And Encourage Employee Seat Belt Compliance For Added Safety. 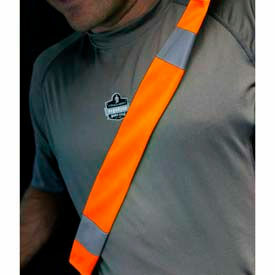 Seat Belt Covers feature level 2 ANSI-compliant reflective material for high visibility and easy identification. Solid polyester construction provides long lasting durability and strength. Used for a variety of settings, including road construction, transportation, delivery vehicle drivers, warehousing/distribution and more. Includes hook and loop closures for secure fit to seat belts. Available in Lime and Orange. Center Mount Reflectors Are Abrasion Resistant, Impact Resistant And Waterproof For Effective Reflectivity In Parking Lots And Outdoor Road Maintenance. Center Mount Reflectors are made with durable plastic for long lasting dependability. Designed to allow impacts to only dimple the HOT Dot, so there is no air gap for water to get inside and affect reflectivity. Retain their reflectivity when abraded by grit and cinders, while traditional acrylic reflectors can lose up to 85% of their reflectivity. Available colors are Amber, Blue, Green, Red, White, and Yellow. Tapco® BlinkerBeacon™ Solar Flashing LED Beacons Serve As An Enhancement Or Warning For Busy Crossings And Heavy Traffic Areas. 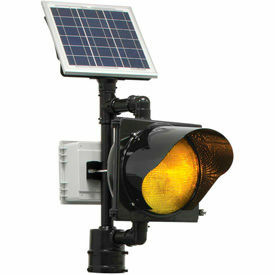 Tapco® BlinkerBeacon™ Solar Flashing LED Beacons are made with polycarbonate housing for long lasting durability. Beacons provide energy efficient 14-watt solar panel for low maintenance. Beacons mount to 4-1/2" OD poles. Various activation methods are available, ranging from 24/7 flashing to time clock activation and cellular notification. 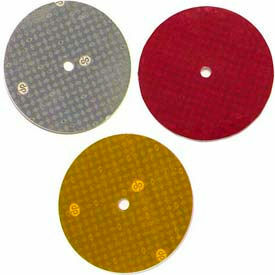 Available color finishes are Amber/Black, Amber/Yellow, Red/Black, and Red/Yellow. Flagstaff™ Heavy Duty Quick Disconnect Warning Whip Identifies Your Vehicle And Equipment To Others. Flagstaff™ Heavy Duty Quick Disconnect Warning Whips are constructed from flexible white fiberglass and nylon mesh for long lasting durability. 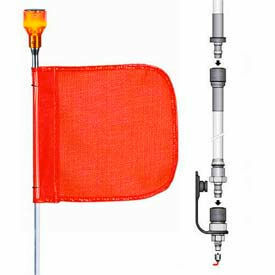 Warning Whips, with either High-Visibility Flag or Flag and Light, provide easy identification of vehicles and equipment in the area. The Flagstaff™ Quick Disconnect Series includes a heavy duty flag and a male quick disconnect for quick vehicle attachment. (Female Quick Disconnect Base Mount must be purchased separately.) Lighted models feature lamp socket, internal electrical wiring and hot plug for power connection. 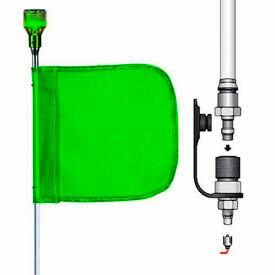 Flag colors available are: Green, Green with White X, Orange, Orange with White X, Yellow and Yellow with White X.Choose from flag heights of 12" and 16" with whip lengths of 3 to 12 feet. Available as Lighted or Not Lighted. Flagstaff™ Heavy Duty Split Pole Warning Whips Warn And Identify Vehicles In The Area. Flagstaff™ Heavy Duty Split Pole Warning Whips are segmented for quick disconnection, easy storage and long lasting durability. The poles are easily broken down into manageable pieces for storage in a toolbox, trunk or back of a truck. 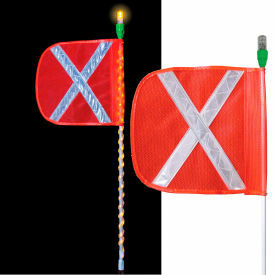 Warning Whips, with either High-Visibility Flag or Flag and Light, include a male quick disconnect for quick vehicle attachment. (Female Quick Disconnect Base Mount must be purchased separately.) Flag colors available are: Green, Green with White X, Orange, Orange with White X, Yellow and Yellow with White X. Flag Heights are 12" and 16". Whip Lengths are 8, 10 and 12 feet. Flagstaff™ Heavy Duty Standard Threaded Hex Base Warning Whips Are Used For The Safety Of Off-Road Vehicles. Flagstaff™ Heavy Duty Standard Threaded Hex Base Warning Whips have bolt-on mounts for easy attachment and long lasting durability. Warning whips, available with High-Visibility Flag or Flag and Light, provide quick and easy identification of vehicles or equipment in your area. Constructed from flexible white fiberglass and nylon mesh, the standard threaded hex base securely attaches to the vehicle. Optional lighted models feature lamp socket, internal electrical wiring and hot plug for power connection. 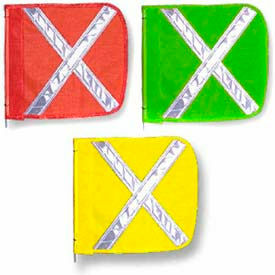 Colored flags are available in: Green, Green with White X, Orange, Orange with White X, Yellow and Yellow with White X. Flag Heights are 12", 16" and 12 feet with Whip Lengths of 3, 5, 6, 8, 10 and 12 feet. Choose from 202 different configurations for your specific needs. Flagstaff™ Light Duty Warning Whips Identify and Warn Off-Road Vehicles In the Area. Flagstaff™ Light Duty Warning Whips are constructed with a repairable .30 inch diameter, 7 foot flexible fiberglass whip and a nylon mesh flag for long lasting durability. The threaded hex mounting base quickly and easily secures the flag on the vehicle. The Non-Lighted Flags are 11-1/4 inch high with flag colors including Black, Blue, Green, Orange, Yellow, Red and White. Flagstaff™ Heavy Duty Replacement Flags Are Bright, Attention-Getting Flags For Optimal Vehicle Recognition And Safety. Flagstaff™ Heavy Duty Flags are constructed with heavy duty nylon mesh for long lasting durability. 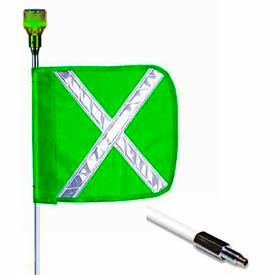 The triangular flags are available with a white reflexite X for greater visibility and easy identification in poor conditions. Flag sizes are 12" x 9", 12" x 11" and 16" x 16". Colors include: Green, Green with White X, Orange, Orange with White X, Yellow and Yellow with White X. Mounting clips are included. Flagstaff™ Whip Mounts And Bases Securely Easily Attach To A Variety Of Different Vehicles. Flagstaff™ Whip Mounts and Bases are crafted from steel with industrial grade brackets, mounts and magnets for long lasting durability. Choose the Easy Mount Adapter with 6" Hot Wire Pigtail for warning whips with standard threaded hex base. The 12 Ga. Black Powder-Coated Steel Flat Surface Mounting Bracket is perfect for use with any warning whip with standard threaded hex base mount, including light or heavy duty whips with various diameter round tubing. Choose from 22 different configurations, including Chrome Plated Heavy Duty Spring Base Mount for use with lighted Flagstaff warning whips up to 8 feet. 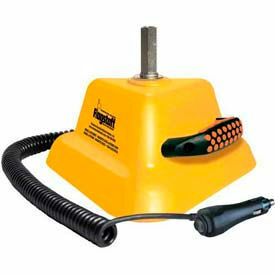 The Magnetic Mount Base with Handle and Coiled Power Cord has a power switch on lighter plug for lighted warning whips with standard threaded hex bases. Also available are Hot Plugs, Billet Fold-Down Clamp Mount Brackets, Adapters and Flange Mounts. Flagstaff™ Whip Lighting Provides Bright, Reliable LED Lighting For A Variety Of Roadside Situations. Flagstaff™ Whip Lighting is crafted from industrial strength materials and the highest quality LED lights for long lasting durability. 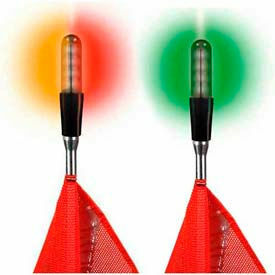 The Rocket™ Super Bright Flashing LED Light works with all Heavy Duty Whips. Choose from 19 different styles, including Flashing LED, Non-Flashing LED and Super Bright Flashing LED.Colors available are: Amber, Amber/Red, Blue, Green, Clear and Red. 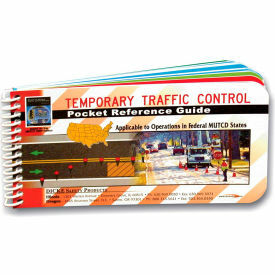 Reference Guides Supply Mobile Friendly Guideline Material For Traffic, Roadwork, and more. Informational wallet cards are designed to be taken on the go or stored in compact spaces. Reference guides provide quick and easy to digest guides. Laminated plastic protects material content from wearing out. Additional specifications vary per model.